In olden days, when the person conveying good news to the King would be rewarded with gold; down South ~ for good deed done, they would say that ‘the finger requires to be rewarded with a gold ring’…………. In Football, there are various awards and the ‘Golden Boot or Golden Shoe’ recognises the top goalscorer of the FIFA World Cup. While every World Cup had a ranking of the goalscorers, the first time an award was given was in 1982, under the name Golden Shoe. It was rechristened Golden Boot in 2010. If there is more than one player with the same amount of goals, since 1994 the tie-breaker goes to the player who has contributed the most assists – in the recently concluded FIFA 2014, it was James David Rodríguez from Colombia who was awarded Golden Boot. Playing either on the wing or in an attacking midfield role, Rodríguez is commonly ranked as one of the best young players in the world. Away from the sporting arena, in Jan 2013, I had posted about the Corporator from Pimpri-Chinchwad, in Pune. The Corporator’s husband Datta Phuge acquired a shirt made of 3.5 kg of gold worth Rs 1.27 crore. Popularly known as the ‘goldman’ in Pimpri-Chinchwad, Dattatray Phuge’s novel attempt to grab eyeballs paid off, when the 40-year-old shot to fame for possessing the most expensive fashion statement the city had seen in a long time. Phuge was spotted wearing a shirt made up of 22-carat pure gold, weighing 3.5 kg including a belt of 325 grams. Now there is more news of another Indian businessman flaunting his wealth by having 4kg shirt made from precious metal... here is something from Daily Mail on the Indian textile magnate who made a fortune from his clothing empire – preferring to wear not what he sells but one made of gold. Reportedly, Pankaj Parakh left school without any qualifications but still created a multi-million pound textile business in India. 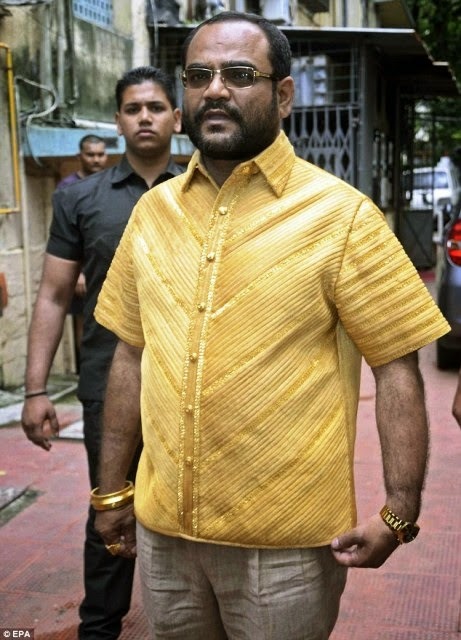 To celebrate his 45th birthday, he wore a solid gold shirt weighing more than 4 kilos. According to local media the gold shirt has really got him noticed as he marched along the streets of his home in Yeola, 260 km from the city of Mumbai – and he reportedly got admiring looks from women and envious looks from men. The shirt that has seven solid gold buttons is due to be officially modelled by the clothing magnate - but he tried it on in advance after collecting it from the Shanti Jewellers at Parel in Mumbai, where a team of around 20 craftsmen collectively spent 3,200 hours over the past two months to 'stitch' it together. The gold used in the shirt has an 18-22 carat purity, without any other metals, and he added: 'Before the taxman starts coming round, I can guarantee that every bit is properly recorded in my company accounts.' Despite being made of gold the shirt has been so carefully made that it is as flexible as a normal shirt, he claims, and also just as comfortable because there is a thin cloth lining the inside. He is a local politician himself and despite criticism that he flaunts his wealth among people who are poorer, he is actively involved in community projects and recently funding 120 operations for polio suffers at the Narayan Seva Sansthan Hospital of Udaipur in Rajasthan.